(Newser) – Wine has been used as a "social lubricant, mind-altering substance, and highly valued commodity" throughout the ages. Now, a discovery just south of Tbilisi details just how far back through the ages the beverage has existed, the BBC reports. Per a study in the Proceedings of the National Academy of Sciences, archaeologists found 8,000-year-old pottery shards in the nation of Georgia indicating wine was once made there in earthenware jars, the earliest evidence ever of grape-based wine production. 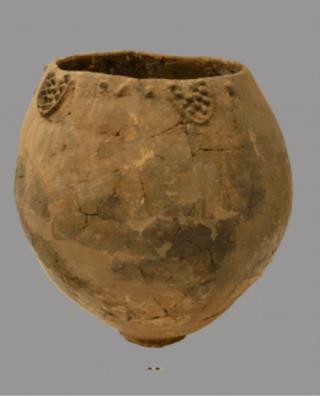 Before the discovery of the fragments from eight jars (the oldest from circa 5980BC) in the Neolithic villages of Gadachrili Gora and Shulaveris Gora, the most ancient proof of grape winemaking came from Iraq, dating between 5000BC and 5400BC. Testing of the Georgian pieces showed evidence of a slew of acids from wine that had been made inside the erstwhile vessels. Did anyone else think this would be an article about an ancient K-Y Jelly? I can't believe they found a casting couch that old.